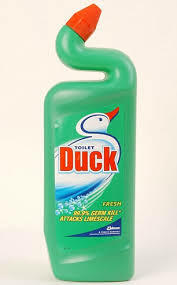 Toilet Duck is a brand name toilet cleaner noted for the duck-shape of its bottle, so shaped to assist in dispensing the cleaner under the rim. The design was patented in the 1980s by Walter Düring from Dällikon, Switzerland. It is now produced by S. C. Johnson & Son.